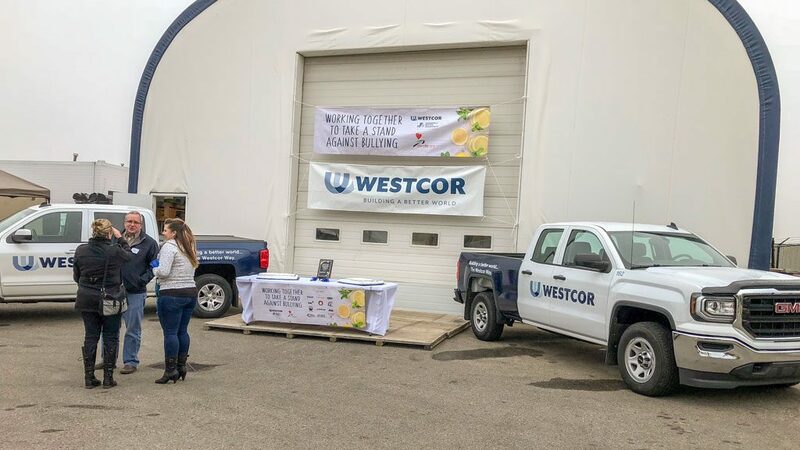 WESTCOR CONSTRUCTION — Westcor Construction in Calgary raised $12,500 for Dare to Care, an anti-bullying program, by setting up a lemonade stand. The fundraiser was the first of many other local charity initiatives the company is doing to celebrate 15 years of being in business. CALGARY, ALTA. — Westcor Construction is taking a stand against bullying in Calgary. The company held a fundraising event last month for Dare to Care, a comprehensive anti-bullying program that has been implemented in thousands of schools across the country. The program provides the tools and support that help youth, parents and educators recognize the signs of bullying and other challenging behaviours. The fundraiser kicked off a larger corporate social responsibility initiative by the company to celebrate its 15th anniversary. Better Community: A Westcor People-First Initiative aims to implement 15 acts of community kindness. The Dare to Care fundraiser was the first act. According to its website, Dare to Care was created with the understanding that bullying is a societal issue and that for people to have any impact, all stakeholders within a school, community or workplace must be involved in creating a climate of change. Since 1999, Dare to Care has delivered three signature programs to over 1,500 schools across Canada. In 2017, Dare to Care adapted its program for amateur sports. Because Dare to Care encourages those who witness bullying to “take a stand” against it, Westcor reached out to its trade partners and design consultants and asked them to sponsor a lemonade stand at the fundraising event. The company raised money to subsidize the anti-bullying programs in 15 Calgary schools. Westcor is also attempting to collect 500 bath towels for Mustard Seed, an organization that helps the homeless and has a critical shortage of towels.